Up till now, my soaps have been colored naturally. I've used cream occasionally from our goat milk to make soap, and discovered that it makes a whiter soap. Who'd have guessed? This is Cranberries & Cream. 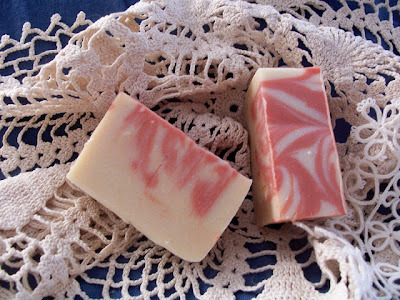 Vanilla oils will darken the soap color. This is Summer Sorbet, a combination of lime, watermelon, and vanilla fragrances. The scent is totally unexpected compared to its appearance - it's totally yummy-smelling. This light celery green is my Herbal soap, made with herb-infused oils that give it that green color. This was a coloring experiment that did turn out ok: red oxide mixed with half of the soap. I'll be doing this one again, in my new mold. It's called Oklahoma Sunset. I don't like it. At all. It looks like mud, and not even Oklahoma red mud, just mud. I'm sure it's because of the natural color of the goat milk soap, sort of a blue + natural brown/yellow = muddy green thing. I definitely prefer to stick with the natural colorants. 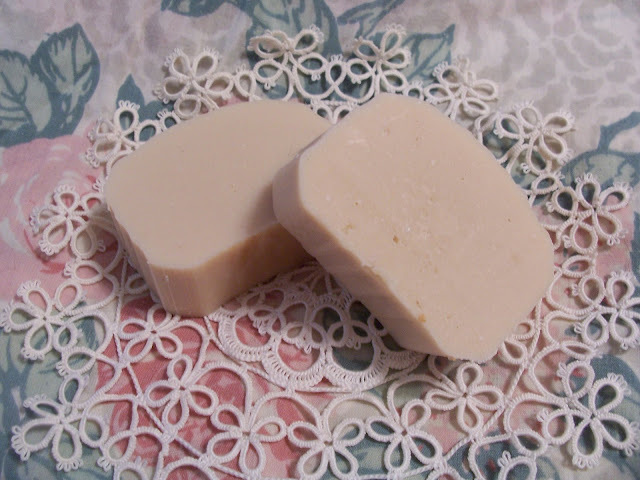 It was back to the drawing board, and I decided to stick with an uncolored soap for this scent. I made the above bar with water instead of goat milk so that it would be white, and super-fatted it a bit more than usual. 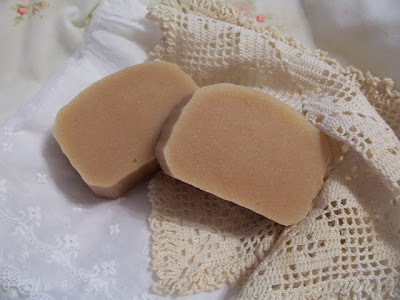 This was my first attempt at using water for soapmaking. Most people start with water and then move to milk soaps, but I did it backwards, and have been making goat milk soap exclusively for years. Because I have more experience with the natural colorants, I feel more comfortable with them, and prefer them to colorants made with who-knows-what. 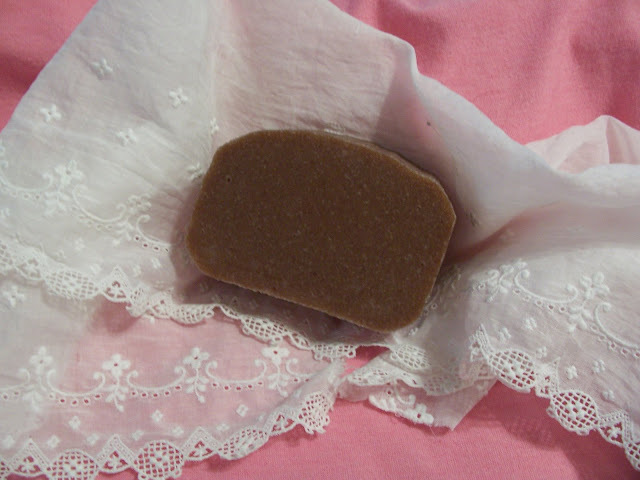 I've also used cinnamon in brown soaps as both a colorant and an exfoliant, and paprika for an orange-y color. I haven't yet found anything that will give a blue or purple color, which is what I wanted for the lavender soap.